The Anatomy of the Perfect Sandwich. I'll keep this short and simple. Sandwiches are delicious. There's no other way around it. They're simple, they're quick, and there's an infinite number of ways to make them. Anyone who denies loving a good sandwich is a person I find highly suspect. "All of human kind has one thing on common. The sandwich. I believe that all anyone really wants in this life is to sit in peace and eat a sandwich." I couldn't agree with you more, Lemon. If you don't watch 30 Rock [if so, what's WRONG with you? :)], then check this out. That being said, here's my go-to sandwich. Certain variables change, but the basic layers stay the same. For a simple, cold cuts sandwich, I prefer a nice, hearty wheat bread. For this one, I used Arnold's Healthfull Flax & Fiber bread. When I'm being less health conscious, there's nothing like crisp ciabatta bread. Yum. Some people like to lather on the mayonnaise, but I can't stand the stuff. If I ever do use it, it's very sparingly. I do love honey mustard [it's perfect with turkey or ham], but for this sandwich, I used cream horseradish, because it's fantastic with roast beef. Baby arugula or baby spinach are my go-to veggies [I used spinach in this one] but I also like using alfalfa sprouts [or any other veggie in sprout form] or fresh basil for an Italian twist. The simplest sandwich uses cold cuts, and I love turkey, ham and roast beef. The roast beef was particularly tasty this week, and has a stronger flavor than the other two [in my opinion]. I do love having extra grilled chicken breasts on hand in the fridge, since those are perfect in a sandwich. If I'm going vegetarian, my protein of choice is mashed chickpeas, or hummus. I also love using avocado in place of meat. It's not high in protein, but the good fat content satiates any need for meat. I don't buy avocados enough since they've been on the pricier side recently, but they are a favorite of mine. I like to add on a couple extra fixings to a sandwich. Apple slices add a great crunch to a sandwich, and pair really well with cheddar cheese; the same goes with pears. But when heirloom tomatoes are in season, that's the first thing I'll use. 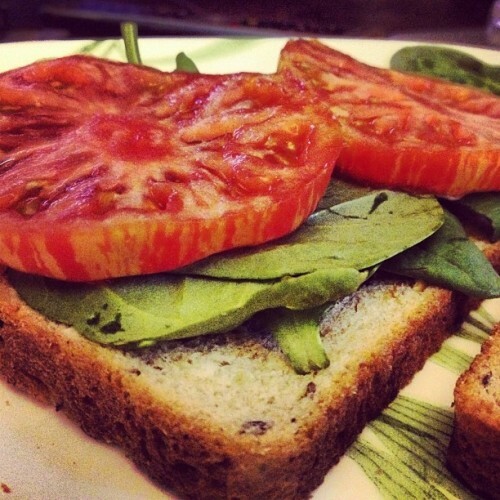 They're unlike any other tomatoes, and they're usually the perfect size for a sandwich. For this sandwich I had an heirloom on hand, and also topped it with some thinly sliced white Vermont cheddar. And there you have it: simple, unfettered with, and always delicious. Make it healthy, make it gluttonous- the choice is yours. Therein lies the beauty of the sandwich. In "30 rock", "arnold healthfull bread", "baby spinach", "cheddar cheese", "cooking", "heirloom tomatoes", "horseradish", "liz lemon", "lunch", "recipes", "roast beef", "sandwich", "wheat bread"